Current outage map from BC Hydro. COURTENAY B.C- Multiple power outages have been recorded around the valley, likely due to the upwards of 80km/hr winds. 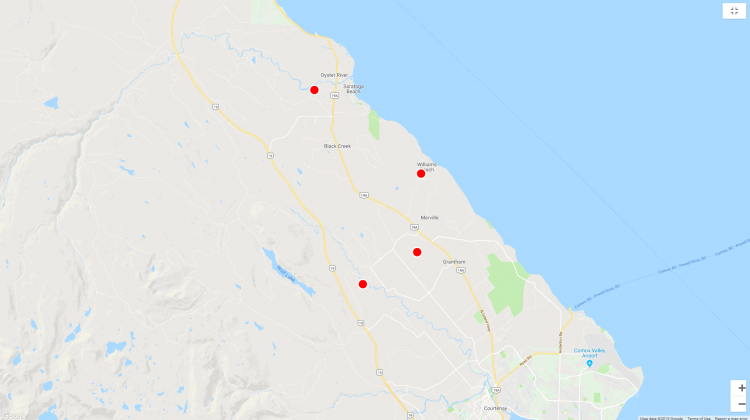 B.C Hydro have released a map showing multiple power outages across the Comox Valley, with the most regions affected near Black Creek. -2800 block Davis Rd. Wire down. -West of Carlson Rd, North of Tory Rd, East of Fortnum Rd, South of Farnham Rd. Under investigation. Affected residents: approximately 50. – East of Inland Island Hwy, West of Macham Rd, South of Michaels Dr, North of Burns Rd. Under investigation. Affected residents: approximately 70. -South of 5th St, North of Winn RD, East of Inland Island Hwy, West of Fitzgerald Rd. Under investigation. Affected residents: approximately 20.